Glowing yellow, teal, blue, hot pink. These shades of the surreal and of dreams blanket two figures floating in a pool of foggy yellow, blue and green. Bundles of flowers grow out of the figures’ mouth, shoulder and chest as they lie in a deep, seemingly perpetual stillness. The flowers, upon first glance, come as a benign symbol of life and growth, but closer examination reveals that the plants are in fact taking over the two bodies—more like invasive parasites than signifiers of the living. This photo, titled simply “For Yarrow,” will be one of 18 at Talaina Kor’s upcoming exhibit, Color Study, at Coconino Center for the Arts’ Hidden Light gallery. “I was so excited when this happened. You know, I had a professor in Chicago who told me straight up, ‘Your photos are bad,’ and now I have this exhibit,” Kor says. Kor’s use of technology to manipulate photos gives her work its own mythology, presenting to its viewers a world in which women break free from within giant chicken eggs and flowers sprout out of human shoulder blades. Her photos beg a suspension of disbelief but also a confrontation with reality: namely, the human body and its susceptibility to death, pain, wounds. Kor began using software to edit her photos when she was 16. Photoshop was expensive, so she made do with online programs, teaching herself how to use them through YouTube tutorials. “I actually started doing [art] photography on my mom’s flip phone. I would tape it to my ceiling and time it,” Kor says. The 22-year-old spent one year at the Art Institute of Chicago as a Fine Art Photography major and another year at Northern Arizona University in the same field. Two months after Kor returned from Chicago, her best friend, Yarrow, died of cancer. Just 20 at the time, Kor says the photo attributed to her friend was in many ways a response to an event that changed her life. “The one for Yarrow was rare, because I remember thinking of what I wanted and it came out just how I wanted,” she says. Emotions, mortality, religion—each are explored in Kor’s images, and they appear in various iterations and spaces both in the form of the ethereal and whimsical as well as the grotesque. Another photo in the series shows a severed arm, which is lit by Kor’s signature lighting—hues that are easy on the eye, almost palpably sweet. The light is a strong contrast to the bloody arm, whose puppet hand is being sewn back on by its owner. “I just really like the very surreal. I do like having that dark macabre, almost sad [feeling], with the vibrant colors making it less somber, making it more whimsical,” she says. To create these colors, Kor says, she photographs primarily at night, using LED strips of different colors to cover her computer screen, which provides the lighting. Kor first began photographing at 14, when she was made photographer of the Holbrook Tribune. Her mother helped her at the time, providing her with her first digital camera. The subjects of Talaina’s photos are often her two brothers, her mother, her roommates—frequently her youngest brother, Joshua, she says. “I’ll just make my brother come down the stairs for photos and he hates it,” Kor says with a laugh. 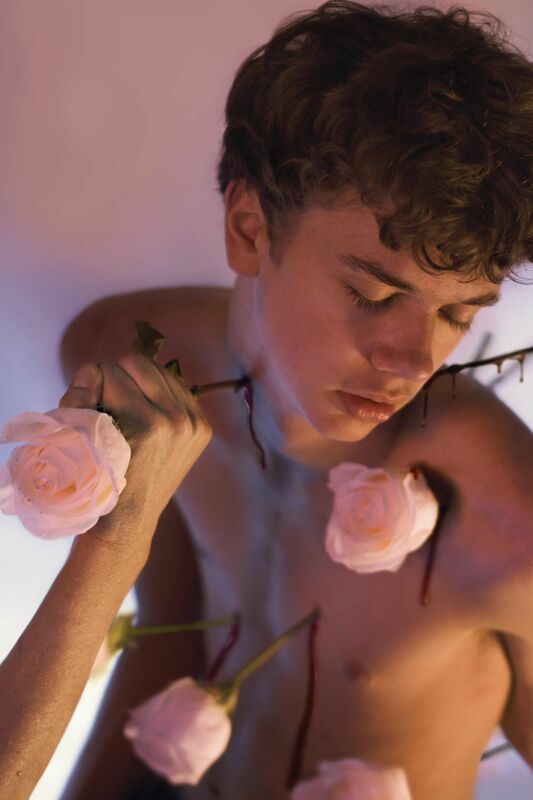 In “Estocada,”Joshua can be seen from above, roses piercing through the skin of his neck. Another instance of the beautiful—plants—invading the body. “'Estocada,' the title comes from bullfighting. Basically it’s the blow that’s supposed to kill the bull. Meanwhile, roses are supposed to be this romantic thing, but they’re through the neck,” she says. In the photo “For Yarrow” and other works, plants also interact with human subjects. “It was this entire year of her body destroying itself, and it was just me, her and her parents there, so I decided to do that series with something docile like plants, making them into a kind of cancer. Making plants aggressive, more violent. The thing is I kind of wanted the people to look docile and the plants to look like parasites consuming this person,” Kor says. “The Goodness and Severity,” the photo of the severed hand, touches on Kor’s use of photography as a mechanism with which she has also explored her experience being raised Mormon. Similarly, in the photo “A Very Peculiar and Delicate Organism,” a woman sits without a head, a teacup in her hand left spilling its contents and a copy of “The Awakening” lying to the right of her. “I was raised in a Mormon community, very staunch Mormon until I was a teenager. Being trained about modesty, married at a young age and being a subordinate. This piece is kind of how men depicted women as being fragile or easily broken,” she says. Kor’s use of photography as a means of navigating both her physical and emotional world, with an emphasis on the grotesque and also the fantastical and playful, is something that has continued to grow. The medium, she says, possesses the ability to parse through the state of things—a visual glimpse at life’s inner workings.